chemical compound, NH3, colorless gas that is about one half as dense as air at ordinary temperatures and pressures. It has a characteristic pungent, penetrating odor. Ammonia forms a minute proportion of the atmosphere; it is found in volcanic gases and as a product of decomposition of animal and vegetable matter. Because ammonia was formerly obtained by destructive distillation of horns and hooves of animals, its water solution was called spirits of hartshorn. Ammonia has also been called alkaline air and volatile alkali. Anhydrous (water-free) ammonia gas is easily liquefied under pressure (at 20°C; liquid ammonia has a vapor pressure of about 120 lb per sq in.) It is extremely soluble in water; one volume of water dissolves about 1,200 volumes of the gas at 0°C; (90 grams of ammonia in 100 cc of water), but only about 700 volumes at room temperature and still less at higher temperatures. The solution is alkaline because much of the dissolved ammonia reacts with water, H2O, to form ammonium hydroxide, NH4OH, a weak base. Liquid ammonia is used in the chemical laboratory as a solvent. It is a better solvent for ionic and polar compounds than ethanol, but not as good as water; it is a better solvent for nonpolar covalent compounds than water, but not as good as ethanol. It dissolves alkali metals and barium, calcium, and strontium by forming an unstable blue solution containing the metal ion and free electrons that slowly decomposes, releasing hydrogen and forming the metal amide. Compared to water, liquid ammonia is less likely to release protons (H+ ions), is more likely to take up protons (to form NH4+ ions), and is a stronger reducing agent. Because strong acids react with it, it does not allow strongly acidic solutions, but it dissolves many alkalies to form strongly basic solutions. chemical compound, NH4NO3, that exists as colorless, rhombohedral crystals at room temperature but changes to monoclinic crystals when heated above 32°C;. It is extremely soluble in water and soluble in alcohol and liquid ammonia. chemical compound, (NH4)2SO4, a colorless-to-gray, rhombohedral crystalline substance that occurs in nature as the mineral mascagnite. It is soluble in water and insoluble in alcohol or liquid ammonia. ..... Click the link for more information. . Ammonium salts of weak acids are readily decomposed into the acid and ammonia. Ammonium carbonate, (NH3)2CO3·H2O, is a colorless-to-white crystalline solid commonly known as smelling salts; in water solution it is sometimes called aromatic spirits of ammonia. Ammonia reacts with certain metal ions to form complex ions called ammines. Ammonia also reacts with Lewis acids (electron acceptors), e.g., sulfur dioxide or trioxide or boron trifluoride. ..... Click the link for more information. reactions. It burns in oxygen to form nitrogen gas, N2, and water. In the presence of a catalyst (e.g., platinum) it is oxidized in air to form water and nitric oxide, NO. It reduces hot-metal oxides to the metal (e.g., cupric oxide to copper). , commercial process for the synthesis of ammonia, NH3. Pure hydrogen and nitrogen gases are mixed in the appropriate proportion, heated to between 450°C; and 600°C;, compressed to about 1,000 atmospheres pressure, and passed over a catalyst. ..... Click the link for more information. , in which nitrogen is combined directly with hydrogen at high temperatures and pressures in the presence of a catalyst. It is obtained as a byproduct of the destructive distillation of coal. Ammonia is also prepared synthetically by the cyanamide process: nitrogen gas combines with calcium carbide, CaC2, at high temperatures to form calcium cyanamide, CaCN2, and carbon; the calcium cyanamide reacts with steam to form calcium carbonate, CaCO3, and ammonia. For use in the laboratory, ammonia is prepared by heating an ammonium salt with a strong base. It can also be prepared by reacting a metal nitride with water. Ammonia solutions are used to clean, bleach, and deodorize; to etch aluminum; to saponify (hydolyze) oils and fats; and in chemical manufacture. The ammonia sold for household use is a dilute water solution of ammonia in which ammonium hydroxide is the active cleansing agent. It should be used with caution since it can attack the skin and eyes. The vapors are especially irritating—prolonged exposure and inhalation cause serious injury and may be fatal. Water solutions of ammonia are also called ammonium hydrate, aqua ammonia, or ammonia water; the solution may contain up to 30% ammonium hydroxide by weight at room temperature and pressure. , 1853–1932, German physical chemist and natural philosopher, b. Riga, Latvia. He was professor of chemistry and director of the chemical laboratory (1886–1906) at the Univ. of Leipzig. ..... Click the link for more information. for the synthesis of sodium carbonate; in the synthesis of numerous organic compounds used as dyes, drugs, and in plastics; and in various metallurgical processes. (NH3) the simplest chemical compound of nitrogen and hydrogen. Ammonia is one of the most important products of the chemical industry; the synthesis of ammonia from hydrogen and atmospheric nitrogen is the basic method for obtaining so-called fixed nitrogen. In nature ammonia is formed during the decay of nitrogen-containing organic compounds. The name “ammonia” is an abbreviation of the Greek hals ammoniakos or the Latin sal ammoniacus; this was the name given to ammonium chloride, which was produced at the oasis Ammonium (now Siwa) in the Libyan desert. Physical and chemical properties Ammonia is a colorless gas with a sharp, suffocating odor and a pungent taste. The density of gaseous ammonia at 0°C and 101.3 kilonewtons (kN) per square meter (760 mm Hg) is 0.7714 kg/m3; it has a boiling point of -33.35°C, a melting point of -77.70°C, a critical temperature of 132.4°C, a critical pressure of 11.28 MN/m2 (115.0 kilograms-force [kgf] per square centimeter), a critical density of 235 kg/m3, and a heat of vaporization of 23.37 kilojoules per mole (5.581 kilocalories [kcal] per mole). A dry mixture of ammonia and air is capable of exploding. At room temperature the explosive limits lie between 15.5 percent and 28 percent ammonia. The range broadens with increased temperature. Ammonia is readily soluble in water (at 0°C one volume of water absorbs approximately 1,200 volumes of ammonia; at 20°C, about 700 volumes of ammonia). At 20°C and 0.87 MN/m2 (8.9 kgf/cm2) ammonia is readily converted to a colorless liquid with a density of 681.4 kg/m3 and strong optical refractivity. Like water, liquid ammonia is strongly associated, mainly through the formation of hydrogen bonds. Liquid ammonia for all practical purposes does not conduct electricity. It is a good solvent of a large number of organic and inorganic compounds. Solid ammonia consists of colorless cubic crystals. The ammonia molecule has the form of a regular triangular pyramid with the nitrogen atom at the apex. The angles between the H—N—H bonds are 108°. Interatomic distance N—H is 1,015 Å, H—H is 1.64 Å. An interesting property of ammonia molecules is their ability to undergo structural inversion—that is, to “turn themselves inside out” by the passage of the nitrogen atom through the basal plane of the pyramid formed by the hydrogen atoms. Inversion is associated with emission of radiation of a very definite frequency. On the basis of this property an apparatus was constructed for determining time with very great precision (the molecular generator). Such “molecular clocks” have made it possible to determine in particular that the duration of the terrestrial 24–hour day increases each year by 0.43 microseconds. The dipole moment of the ammonia molecule is 1.43 Debyes. Ammonia is diamagnetic because of the absence of unpaired electrons. Ammonia is an extremely reactive compound. Because of the presence of an unshared pair of electrons in the N molecule, addition reactions are especially marked and are easily realized by the ammonia molecule. Particularly important is the reaction in which a proton is added to the ammonia molecule, leading to the formation of the ammonium ion, NH4+, which in compounds with the anions of acids behaves like the ions of the alkali metals. When ammonia is dissolved in water, such reactions occur with the formation of the weak base ammonium hydroxide, NH4OH; they also occur when ammonia interacts directly with acids. A common addition reaction is the formation of ammoniates by the action of gaseous or liquid ammonia on salts. Substitution reactions are also characteristic for ammonia. Depending on conditions, alkali and alkali earth metals react with liquid and gaseous ammonia, forming nitrides (Na3N) or amides (NaNH2). Ammonia also reacts with sulfur, halogens, carbon, C02, and other substances. Under ordinary conditions ammonia is quite resistant to oxidizing agents. However, when ignited, it burns in an oxygen atmosphere, forming water and free nitrogen. Catalytic oxidation of ammonia produces nitrogen oxides, which are then converted to nitric acid. Production and use Ammonia may be produced under laboratory conditions by displacing it from ammonium salts with strong alkalis according to the following equation: 2NH4C1 + Ca(OH)2 = 2NH3 + CaCl2 + 2H20. The oldest industrial method of producing ammonia is to separate it out from the gases emitted in the coking of coal. The principal modern method for industrial production of ammonia is its synthesis from the elements nitrogen and hydrogen, as proposed by the German chemist F. Haber in 1908. The most widespread and economical method for obtaining crude gas for the synthesis of ammonia is the conversion of hydrocarbon gases. The initial raw material for this process may be natural gas, gaseous by-products of petroleum refining, or residual gases from the production of acetylene. The essence of the conversion method of obtaining a nitrogen-hydrogen mixture consists in the decomposition at high temperatures of methane and its homologues to hydrogen and carbon monoxide by the oxidizing agents water vapor and oxygen. Atmospheric air or air enriched with oxygen is added to the converted gas during this process. The synthesis of ammonia from its elements (N2 + 3H2 ⇌ 2NH3 + 92.1 kJ; 1 kJ=0.24 kcal) takes place with generation of heat and decrease in volume. From the point of view of equilibrium the most favorable conditions for the formation of ammonia are the lowest possible temperature and the highest possible pressure. Without catalysts the synthesis reaction of ammonia will not take place at all. In industry iron catalysts obtained from the reduction of molten oxides of iron, Fe304, with activators (A1203, K20, CaO, Si02, and sometimes MgO) are used exclusively. An important step in the synthesis is the purification of the gaseous mixture from catalytic poisons, which include substances containing S, O2, Se, P, As, water vapor, and CO.
Methods for the production of synthetic ammonia are designated according to the pressure applied: low-pressure (10–15 MN/m2), medium-pressure (25–30 MN/m2), and high-pressure (50–100 MN/m2) systems. Medium-pressure systems (30 MN/m2 and 500°C, 1 MN/m2 being approximately equal to 10 kgf/cm2) are the most widespread. 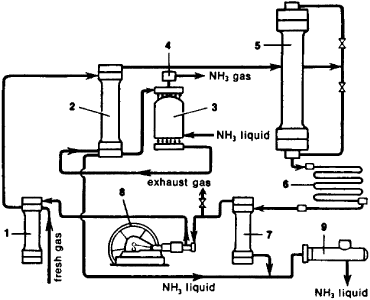 Multiple circulation of the nitrogen-hydrogen mixture—the ammonia condensing cycle—is used to increase the utilization of gases in modern systems of ammonia synthesis (see Figure 1). Fresh gas (nitrogen-hydrogen mixture) and nonreacted, so-called circulating, gases first enter the filter (1), where they are cleansed of impurities, then go to the intertubular space of the condenser column (2), giving up their heat to the gas moving through the pipes of the column. Farther on, the gases pass through the condenser (3), in which they are further cooled and in which ammonia carried by the circulating gases is condensed. From the condenser the cooled mixture of gases and condensed ammonia goes to the distributing section (separator) of the condensation column, where liquid ammonia is separated and carried along the pipe to the reservoir (9) as a finished product. Gaseous ammonia emerging from the evaporator is freed of drops of liquid ammonia going through the spray trap (4) and is directed to the reprocessing plant or to the refrigeration plant for condensation. Gases freed of ammonia go from the separator to the synthesizing column (5). Inside the synthesizing column is a catalyst compartment with tubular or shelved packing and a heat exchanger. Gases interact on passing through the synthesizing column; the gaseous mixture emerging from the column contains 15–20 percent ammonia. Farther along, the gases enter the condenser (6), in which the condensation of ammonia also occurs. Liquid ammonia is separated out in the separator (7) and enters the reservoir, while the nonreacted gases are circulated by the pump (8) to the filter for mixing with a fresh nitrogen-hydrogen feed. Ammonia is used to produce nitric acid, nitrogen-containing salts, urea, hydrogen cyanide, and soda by the ammonia method. Because liquid ammonia has a high heat of evaporation, it serves as a working medium in refrigeration machines. Liquid ammonia and its aqueous solutions are used as liquid fertilizers. Large quantities of ammonia are used for the ammoniation of superphosphates and fertilizer mixtures. Tekhnologiia sviazannogo azota. Moscow, 1966. NH3 A colorless gaseous alkaline compound that is very soluble in water, has a characteristic pungent odor, is lighter than air, and is formed as a result of the decomposition of most nitrogenous organic material; used as a fertilizer and as a chemical intermediate. A chemical used as a refrigerant, esp. in large low-temperature refrigeration systems (as in ice skating rinks) because of its high efficiency.